There are different types of color models and most of them are organized in a circle. Color is a visual sensation of electro magnetic waves. The eye is the organ that is able to perceive these wavelengths. The eye perceives waves which have wavelengths between 380 nanometers and 780 nanometers. Between these wavelengths we can see every color – starting with violet at the low wavelengths up to red at the high wavelengths with every color in between. This explanation makes clear that a true color model is not circular but rather linear – wavelengths decrease or increase and become invisible for the eye. But we also notice that both ends – violett and red – are very similar and can indeed go from one to another. Now to the practical part for mixing colors on your palette. (Here I show you a low budget glass palette with which you can place color chips beneath to make matching colors much easier). The Munsell color system is the most logical color system – forget about other color systems. It defines colors by Hue (red, yellow, blue, green, blue-green, yellow-red ect. ), Value (the lightness of a color; starting at 0 for a perfect black up to 10 for a perfect white – both can`t be represented by tube paints), and Chroma (purity of a color; the lower the chroma the more it tends to a neutral grey). The right hand side of the picture above is an example of only one hue – 5R. You can download photos of the big Munsell book or use this handy online-tool Virtual Munsell Color Wheel. Keep in mind that trying to mix a screen color with paint is impossible which makes a big difference in perceiving color. But for a general impression it is what you’ll need in your atelier. Actually there are more hues than in the image above – each hue is divided by 2.5, 5, 7.5 and 10. The original Munsell Book of Color* is very pricey but has over 1600 standardized color chips, the New Munsell Student Color Set* has too few chips to be helful in your atelier at home but is an affordable introduction to the concept of the Munsell system. Get me to the Color Charts! Now that you know about the three different properties of color try to judge colors that you see by these three properties. If you need some help to judge a certain color then use the Munsell Wall chart. This color definetly is neither blue nor green. Is it red? Yes a little bit. Is it also yellow? A little bit too. So it must be a yellow-red or simply orange. But it is not a pure yellow-red. The chroma is neither neutral/grey nor full strenght. It’s lightness is about half dark and half light – so it’s about value 5 or so. In case to match this particular color mix a pile of yellow and red (for example Cadium Yellow and Cadmium Red) to a strong chromatic orange. Now come the neutrals in handy (how to mix neutrals and store mixtures in bulk can be read here). 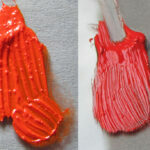 Take your Value 6 Neutral and mix the orange in. Not too much at first to judge the needed portion for going another step to more chroma. Our original orange mix also has a value of about 6 so the lightness of the neutral-orange mix won’t change. Now you can move closer to your target color by playing with yellow, red and neutral. 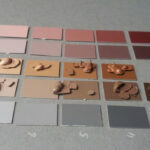 Most of the colors that we see in nature are low chroma colors (see Munsell analysis of different objects or read this excellent article on the blog “Muddy Colors”). Most skin tones fall into a small range between the reds and yellow-reds at less than chroma 4 – for black and for white, for yellow and red ones. See here at the bottom of the page. Artist Gregory Mortensen shows his approach to working with a Munsell system palette for portraits. Read more about color on huevaluechroma. This is THE RESSOURCE for color in the internet for artists. I am looking to work on the theory that different hues have different strengths and so should occupy more or less space around the wheel, whilst still being split into the 10 hue factions. Mixing paint colours can be scientifically and mathematically calculated in this way. This theory must also apply to the colours of light eg. Blue is a dominant atmospheric colour in a landscape due to refraction through water molecules in the atmosphere. Another theory would be to include the existing hue portion numbers 1-10 into an algebraic equation based upon a percentage of strength or weekness of each colour hue, value and saturation. I was wondering if I missed 3 on the “Farnsworth Munsell 100 Hue Test” what is my score, a bit confused, as the high score for my age group was 162? out of what, 200? I am not sure how to get the percentage? I too am a bit disappointed with my score (and would have loved to know where I didn’t get the colors correct), I was hoping for 100 thinking because I grew up playing in my grandfathers paint store/factory and being around color all my life, along with when I go to the store to out pick color to match something at home or for a friend I can match the color perfectly in fact my designer friends are amazed….I thank you for your website and look forward to learning more and improving in my passion for painting, also knowing how to get my score on the test mentioned above. Just wanted to know what was the colour palette used by the old masters….